What can South Asia expect from the UN climate talks in Lima? The Conference of the Parties (COP) beginning in Lima is an extremely important meeting, because it will lay the foundation for a global agreement at the next COP in Paris next year. My expectation is that the negotiators and delegations take a deep look at the findings of the Fifth Assessment Report of the Intergovernmental Panel on Climate Change (IPCC). This powerful document provides the latest and most up-to-date scientific assessment of climate change. It clearly demonstrates the overwhelming responsibility of human society in having caused this problem, the increasingly serious impacts of climate change and outlines actions to mitigate greenhouse gases emissions. A twin strategy of adaptation and mitigation is expected to emerge from Lima based on the realisation that adaptation alone will not work. Also, delays in mitigation will make the task of limiting temperature increase to 2 degrees Celsius by the end of this century increasingly difficult. If early action is not taken the costs of mitigation will become disproportionately high and technologically infeasible. The Conference of the Parties in Lima will be a combination of celebrations, frustrations and expectations. Celebrations will be primarily about the recent China-US climate pledges: the US will seek to reduce carbon emissions by 26-28% by 2025 (against 2005 levels); China will peak carbon dioxide emissions by 2030 with an “intention to try to” peak sooner. The EU’s more aggressive targets to reduce greenhouse gas emissions (40% by 2030 against 1990 levels) and increase the share of renewables to 27% will also be celebrated. The frustrations will centre on the weakness of these ambitions, notwithstanding their political and rhetorical punch. The Council on Energy, Environment and Water’s calculations find that both the US and Chinese targets are lower than their earlier 2020 targets. This will mean less carbon space for the rest of the world. Equally, there will be frustration about the inability of the Green Climate Fund to raise US$10 billion. Although the amount pledged came close to the target, non-Annex I countries will not take comfort. What guarantee is there for US$100 billion in 2020, when a fraction of that sum is barely scraped together? During the Lima COP, countries (rich and poor) will generate expectations for their “intended nationally determined contributions” and a draft agreement which will be debated in the run up to Paris in 2015. India is likely to showcase its domestic climate actions more forcefully at Lima and beyond. Finally, various issues emanating from the IPCC fifth assessment report will get attention, particularly the role of negative emissions and tackling short-lived climate pollutants. The Lima Climate Conference follows stern warnings by eminent climate scientists about the severe, widespread, and irreversible impacts of climate change in the business as usual scenario. We have seen some important political developments, which include the US-China climate deal and pledges to the Green Climate Fund by the developed countries. However, given the urgency and scale of action required, these are tiny steps on the long road towards stabilising the climate system and helping poor countries adapt to the adverse impacts. 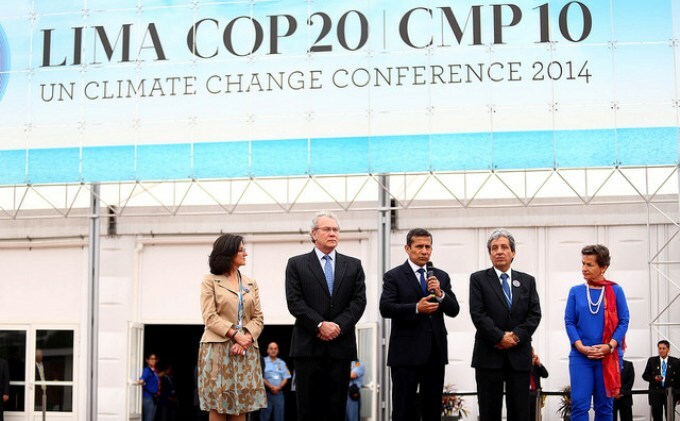 COP20 in Lima is expected to define the scope and content of the 2015 agreement, urge all countries to revise their pre-2020 mitigation ambitions and draw up a roadmap for global finance towards 2020. COP20 should make decisions on the long term goal of shifting towards a 100% renewable energy future as early as possible, but no later than 2050. The conference should also adopt a work plan for a loss and damage mechanism to benefit vulnerable developing countries. Lima will be an attempt to lay down the basis of negotiations leading up to Paris. With the US and China having agreed on a certain trajectory of emission control and reduction, the benchmarks for ambition have been set. It is unlikely that these benchmarks will be exceeded, despite the Alliance of Small Island States and Less Developed Countries insisting on higher aggregate mitigation targets to avoid dangerous climate change. The real contention will be on how to agree on differentiation of obligations, as well as country specific assessments of domestic actions, policies and measures that countries commit to under their Intended Nationally Determined Contributions. I expect India to staunchly defend its redlines on avoiding any kind of legally binding obligations, or agreeing to subject itself to any kind of international scrutiny or assessments of its intended contributions towards dealing with climate change. There has been a notable progress at the UN Framework Convention on Climate Change developing the institutional set up for adaptation. The roadmap for developing countries to reduce the vulnerability of their populations through their National Adaptation Plans is becoming clearer. Early this year, it was agreed that half of the Green Climate Fund’s resources will be allocated for adaptation, out of which half (i.e. 25% of the total funds) will go to the vulnerable countries. The recent pledges of nearly US$10 billion for the fund have provided a much needed boost, though the scale of these pledges are minuscule compared to the actual needs on the ground. The pledges must be transformed into actual unconditional flows of public, grant-based finance as soon as possible. Once the money begins flowing, developing countries must ensure robust, transparent and accountable mechanisms to receive and spend the money effectively. The current emission reduction trajectory is taking the world to over a 4 degrees Celsius rise by the end of the century, painting a devastating picture for poor people and ecosystems. Therefore, it is vital that the 2015 agreement recognises the need for mitigation now and the scale of adaptation actions in the future. There is little doubt that Pakistan is experiencing extreme weather events exacerbated by climate change. We have had four consecutive years of flooding and three years of drought; cyclones, once a rarity, are coming our way all too often. The country that has contributed the least to emissions and is severely impacted by climate change is also the country least prepared. But I think enough time has been spent crying hoarse about our suffering and vulnerabilities. It is time to take a grip of the situation. With significant emphasis on scaling up finance, Lima offers a perfect opportunity to spell out what we need and how the world can assist us. So while climate change is problematic and irreversible, the urgency can be turned into an opportunity to upgrade our technology and build our capacity to realign with the realities of today. I think we should show the world that we are ready to tap the opportunity. For example, Pakistan has turned from a water stressed to a water scarce country. Perhaps we can reach out and ask for help in the agriculture and irrigation sector. Winter drought in the Thar desert and monsoon floods have become a regular feature in Pakistan over the last few years. Like all other climate change affected countries, we need to start assessing mitigation and adaptation numbers to be able to realise our stakes in the green climate fund. We are quite keen to see the loss and damage mechanism take shape in Lima to support compensation. We also need to see how global nations respond in Lima to the rules framed by Green Climate Fund board. It is an opportunity to see much they are willing to contribute to reduce carbon emission before a definitive commitment in Paris. In the absence of a federal minister for climate change in Pakistan, I am not sure how effective our political representation will be in Lima but this will certainly be a defining moment, reminding us to act today for a better tomorrow. Against a backdrop of mistrust and broken promises, the COP 20 has a challenging task of producing concrete texts, suggestions to influence the more substantive 2015 Paris event. My hope is that we will shun naivety and hyperbole and forge meaningful consensus on specific issues. Countries like Bangladesh on the front line of climate change bring a dual role to Lima – as victim and as teacher on adaptation and resilience. I am not expecting any dramatic breakthrough but if Lima can generate a more credible sense of engagement – not just to participants but from observers at home – then that will be progress. Will developed countries, especially the US, reduce their emissions by the desired amount? Will the big players among developing countries, namely India, China, Brazil and South Africa respond adequately to the need for mitigation? The recent agreement between the US and China signals a flicker of hope. Even so, I remain skeptical that significant progress will be made in Lima. But the CoP process has produced surprise results in the past. So I shall keep my fingers crossed that major decisions are taken in Lima. The climate talks will be an opportunity to address a few “red lines”/ conditions of developing countries, while also testing the political momentum, crucial to an agreement on the post-2020 climate deal next year. Some of the issues that need to be addressed are 1) Revise mitigation numbers by developed countries. This will motivate developing countries to put forward science compliant mitigation numbers. 2) Agree to collectively draw up a global climate finance roadmap towards 2020. 3) EU, US and China have already announced their Intended Nationally Determined Contributions (INDC) to mitigation post 2020 and it is expected that all remaining countries will also submit their INDCs by March 2015. 4) Loss and Damage needs to be included in the 2015 agreement. The piece was first published in thethirdpole.net.